Our travels have ended and we begrudgingly are selling our home. Skyhorse is the most unique camper you’ll ever find! 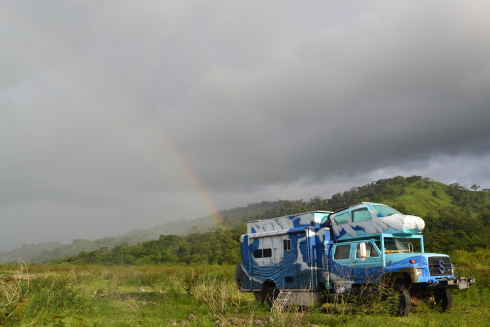 We have traveled in this camper for 22 months from Key West to Alaska to Panama and back. It’s tried and tested. I can tell you everything about it since I built it. There are many features but here are a few to give an idea of what this amazing vehicle offers. The best feature, though, are the smiles, laughs and nods of delight you get while driving it. Our travels have ended but YOUR adventure is waiting to begin. It cost me $60,000 to build I am asking $30,000. Skyhorse is simply Amazing! But he has to take a backseat to your family, friends, and travel! National Geographic Television channel should do a spread on all your adventures! Thanks so much for sharing all your hard work (and fun of course!) with us. I must say however, I think your selling price for “Skyhorse” is much too low! Thanks David! Thanks for following our adventure. And please, make us an offer. Skyhorse deserves a good home!